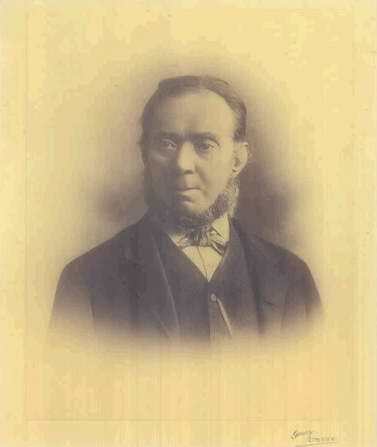 Michael Hogan was born in New Road, Thomondgate in 1832. He gave himself the name “The Bard of Thomond”. He was one of six sons born to Arthur Hogan and Mary Nolan and was baptised in St Munchin’s Church. Arthur Hogan was a wheelwright at Stein’s Distillery, and a musician, who played the flutes and fiddles that he made with his own two hands. Given Arthur’s profession, it is probable that Michael Hogan derived his love of the arts from his father. Hogan was educated at the Christian Brothers School, which at the time was at the crossroads in Thomondgate. Hogan was only eight years old when he wrote his first poem, which over the span of his career turned out to be the first of many. He was a teenager when the hunger hit Ireland and his family experienced some of the ravages of the Great Irish Famine (1845–1848), about which he extensively wrote later in life. He worked in Russell’s Mills, located next to the canal, where he met the clerk, William Doyle, who aided young Hogan in his passion for writing. While working at the mill he wrote his first epic poem on Kincora and Brian Boru, but he failed to find a publisher and in a fit of rage threw these pages into a fire. Soon afterwards his first book of poems called The Light of Munster was published, but they did not sell as well as Hogan wished so he gathered the unsold copies and set about trying to sell them himself throughout Munster. This was not a success either and within the year Hogan had returned to his job in the mill. Hogan married Anne Lynch in 1858 in St Mary’s Chapel and moved with his wife to Nicholas Street. They relocated for a short period to the Park area where Hogan became ill before returning to St Mary’s Parish. Unfortunately, he fell out of favour locally after writing a series of poems attacking some local personalities. Hogan’s first published works appeared in the Anglo-Celt, then in the Irishman, the Nation, the Munster News and the Limerick Leader. His volume of works, Lays and Legends of Thomond, was first published in Limerick in 1861. He then embarked on issuing a series of satirical publications which lampooned prominent figures in the city. They achieved an enormous circulation and caused a great sensation at the time. His epic verses “The Drunken Thady and the Bishop’s Lady” tells the tale of the vengeful wife of the Bishop of Limerick and the night she met the drunk known as Thady. The Bishop’s wife led a life of vice and while alive she roamed the city streets picking fights. After her death she continued her malicious ways. The Drunken Thady was also a ne’er-do-well from Thomondgate who would drink himself into a stupor while evading the police. One night on his way home he met the Bishop’s wife who intended to take him to hell. She managed to toss him over the Thomond Bridge and he landed in the river. This is where he repented all his sins and asked God for forgiveness, vowing to live peacefully if his life was spared. Indeed his life was spared, and he was the Drunken Thady no more. In 1886, Hogan and his wife moved to New York. A fund was raised locally to persuade Hogan to return to Limerick which he did three years later. On his return he worked for the Corporation as the caretaker of the King’s Island Bank walkway for £1 a week. He was asked to write a report for his fee and he did this just once and as follows: “The gentlemen of Limerick Corporation need have no fear that anyone is going to steal the Island Bank; it is safe and in good condition, but the ceiling might be better for an occasional application of whitewash.” To the very end there was something of the insubordinate in his nature. Although there was an intention of publishing a second volume of his Lays and Legends of Thomond, it never came through due to his lack of funds and failing health and eye sight. He died at 8 Rutland Street in 1899 and was buried in Mount Saint Lawrence Cemetery. Kathleen Daly Clarke wrote with the news of his death to her husband Thomas Clarke (who was executed in Easter 1916) . In 1994 there was some controversy as to the importance of Hogan as a poet, although he was well received in Limerick he was not perceived to be a poet of influence, such as Yeats. This was chiefly attributed to his primary education but also to his gruff demeanour that came through in his poetry. What cannot be denied is the impact he had at the time and with future generations. A memorial committee, headed by Jim Kemmy, fundraised to erect a new memorial over the Hogan’s grave, this included the Bard’s face in relief. The “Friends of the Bard” society was founded in 1992, along with funding donated by Peter J Hogan, erected a life-size statue of Hogan outside King John’s Castle in 2005. This article was first published in the May 2016 issue of The Limerick Magazine.